One thousand workers, union members, students, and members of various community groups made their way to Hofstra University in Uniondale, Long Island September 26th to highlight the needs of the 99% at the first Presidential debate. Twenty-five buses left from various neighborhoods in Manhattan, Queens, and Brooklyn, filled with working people mobilized by the #Fightfor15 low-wage workers’ campaign. As the coalition fighting for a $15 minimum wage and union rights for all U.S. workers continues to expand, so does its vision. Women’s rights groups such as the National Institute for Reproductive Health and NLIRH, which has a special focus on Latina and immigrant women’s rights, have joined together with members of the Transit Workers’ Union, 32BJ, the Laundry Workers’ Center, and racial justice advocates from the Garnerway Foundation and others. Environmental justice groups such as Uprose and WE ACT were present along with New York Communities for Change and the Communist Party USA. The student group Fordham Students United held high their banners to “Let Our Teachers Teach” alongside educators from Movement of Rank & file Educators (MORE), and NYS Allies for Public Education. 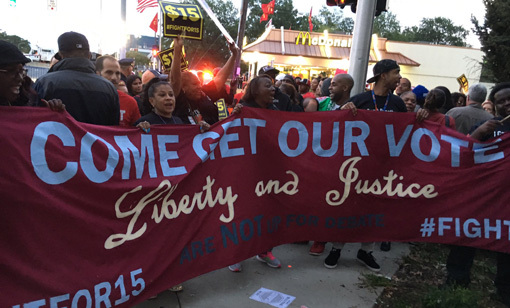 Although police checkpoints and so-called “free speech zones” had been set up to slow down the mobilizations, the #Fightfor15, the largest, most spirited and diverse contingent of protesters outside the debate hall, was undeterred. The Fightfor15 protestors brought with them a broad platform for workers’ rights, racial justice and police accountability, comprehensive immigration reform, reproductive justice, affordable childcare and homecare, affordable housing, quality education, and climate justice. The #Fightfor15 contingent rallied on the streets outside Hofstra, telling politicians to “come get our vote.” Inside the debate, a clear distinction was made between the two candidates. Donald Trump opened by talking about loss of jobs, but blamed it on other countries who he said are “using the U.S. as a piggy bank” to build their economies and who are “stealing our companies and our jobs.” He rested no responsibility on the corporations who are engaging in a global race to the bottom, forcing workers worldwide to compete for the lowest wages. Trump’s favorite international targets were Mexico and China. Domestically, Trump’s favorite targets were migrant workers who he again called, along with African-American people, “gangs,” “illegal,” and “bad people.” While lamenting that “there’s nobody in our government to fight China,” he also bragged about his endorsements from the Fraternal Order of Police, the NRA, ICE, Border Patrol Agents, and military admirals and generals. “I’ll take the generals any day over the political hacks,” the billionaire said, parading his disdain for people who actually study economic and political policy. Trump interrupted and shouted over Clinton, and attacked her for wanting to “approve one of the biggest tax increases in history,” and “increase regulations all over the place.” He bragged that his corporate tax cuts would be “the biggest since Ronald Reagan.” Trump vowed to cut regulations “big league”; later in the debate he said it wasn’t his fault if he ripped off countless workers and small businesses on his way to billionaire status since he was just running a company based on the laws that exist. “If you want to change the laws, change the laws. I take advantage of the laws of the nation because I’m running a company,” said Trump. It is clear that he only wants to change the laws to give corporations even more power to take advantage of others.